As a mom and designer I'm on my feet for most the day and we just moved into our new home that has wood floors, including my studio. I was always wearing flip flops and now that it's getting cold I found myself putting on flip flops with socks...yikes. I saw these Dritz Espadrille Soles and had an idea to create a "house boot" I could wear around the house that still had a comfortable sole but a sock like cover on top. 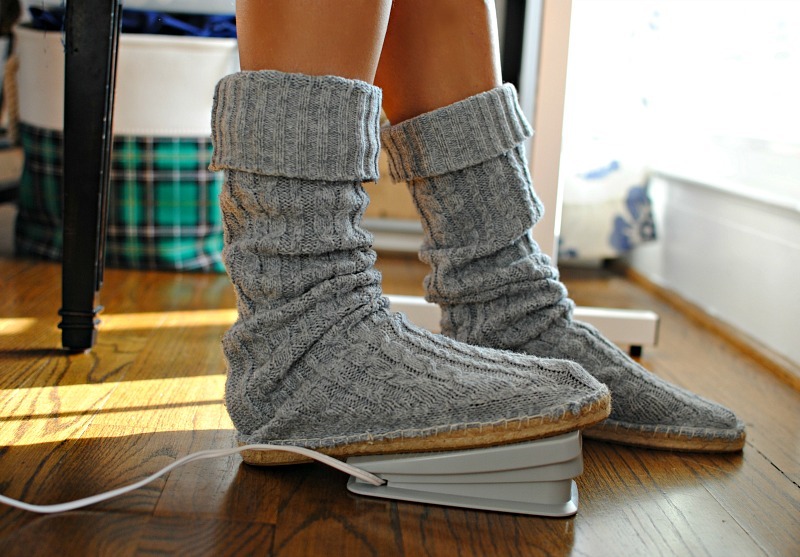 Almost like an Ugg boot but not so heavy and eco-friendly! I dug through my pile of giveaway clothes and came across this old sweater my boys had out grown. It had a raglan sleeve that when cut was the perfect boot shape. It also happened to fit perfectly around the size 8 sole. 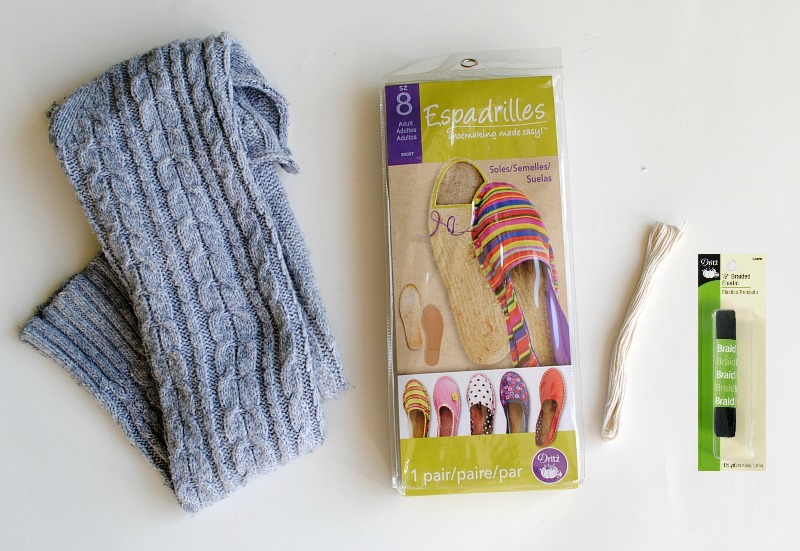 You can also use these espadrille soles to make flats, slippers, moccasins, and sherpa boots. They also have them in toddler sizes so I'm going to have to make some for Louie's Booties one of these days. 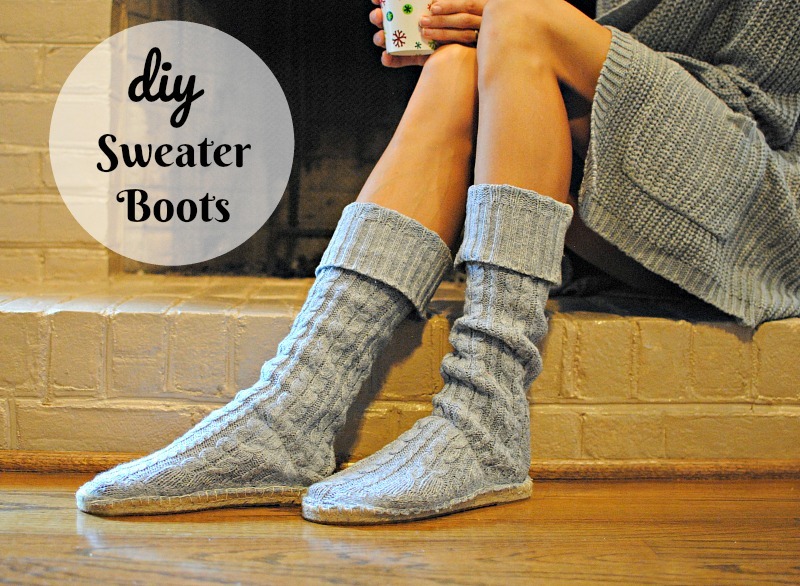 Get the details below to make your own upcycled sweater boots. Supplies: The soles run a bit larger so I went a size down. 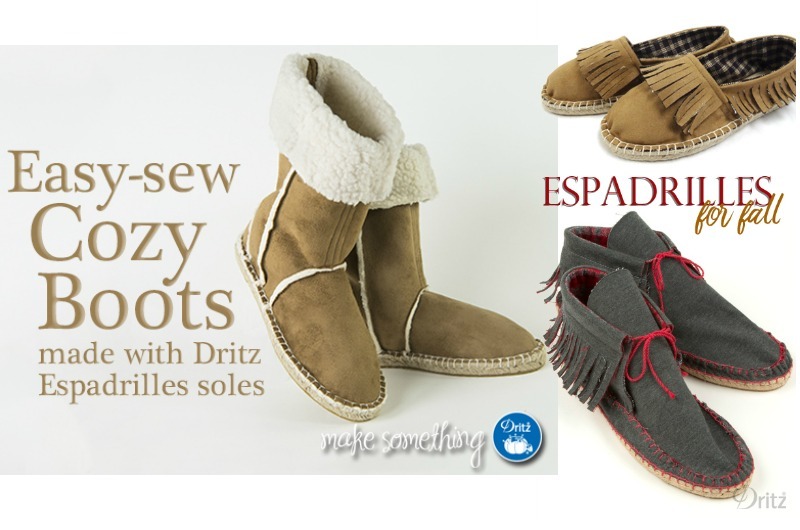 Dritz Espadrille Soles purchase here. When cutting include the seam allowance. This will keep the sweater from unraveling. Cut a strip of elastic that measures the curve of your foot minus 1" (the red dashed line). Sew (zig zag stitch) the elastic on the wrong side where it starts to curve. As you sew, pull the elastic to fit from one side to the other. You want this to be snug but not uncomfortable. This will keep the boot from sliding when you walk. 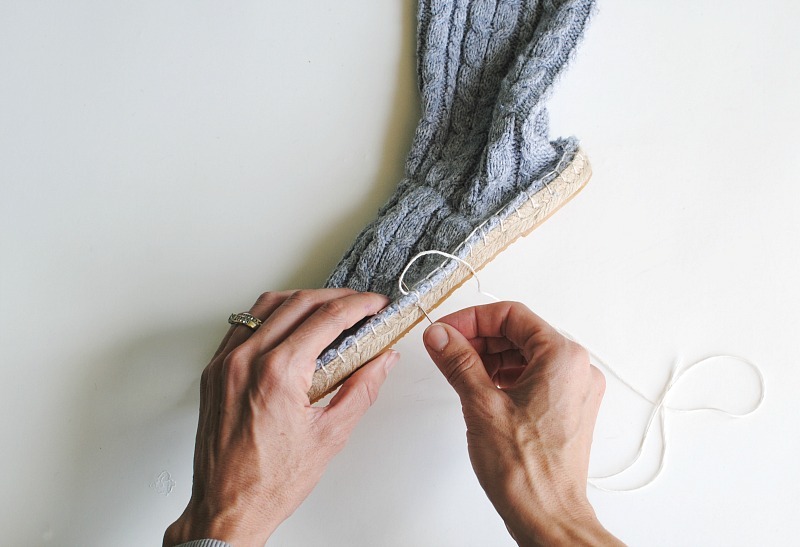 Stretch the bottom of the sweater out to fit the sole. 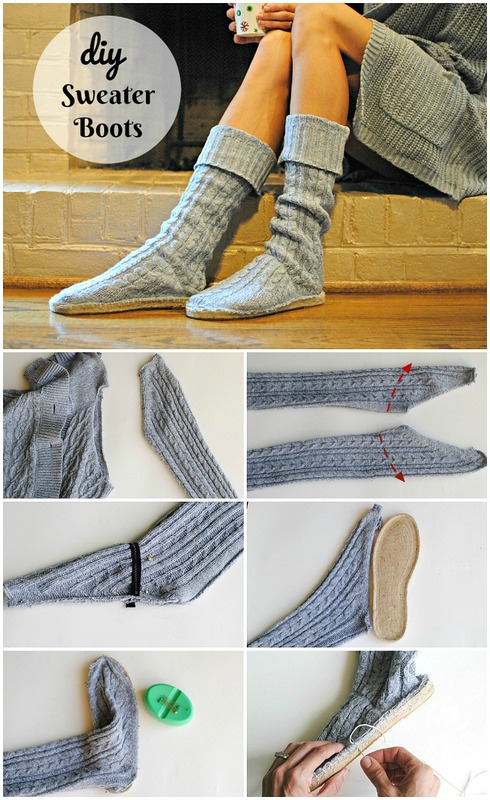 Pin the sweater onto the sole. I pinned the back (where the seam was), the front mid point, and sides. Then added the pins around those points. The pins stick right into the sole. Use yarn and a blanket stitch to attach around the edges. Start from the outer mid sole going to the heel, and continue to wrap around to where you started. The package also comes with thorough instructions to make a pair of espadrille flats. I've been wearing these for days and call them my "Studio Boots." I can't wait to make a few more looks with these like the ones below: click on photo for tutorial. Looking very nice Superb, I really love these designs, Such an amazing design. These look like exactly what I need and coincidently I have just sorted out a pile of old sweaters to dispose of so I can't wait to make these.